Your website address is on your business cards, your flyers, brochures and print advertisements. and/or services. For some business owners their website is the main source of company revenue. Your Tampa or Florida website designer should be able to turn your vision into a reality. Tampa has an overabundance of website designers. Quite frankly, whether freelancers or firms Tampa web designers are a dime a dozen. How do you find "THE ONE" website designer that has all of the talent and creativity you desire at an affordable rate? The strategy isn't foolproof but if you can remember a few simple suggestions, we're sure you'll find a designer that will meet your specific requirements then call us too for a friendly quote. Should You Hire the Cheapest Florida Website Designer? Hiring the "cheapest" web designer generally turns into regret. Yet, hiring a large website design firm could mean that you are paying for all of their big firm amenities. The other downfall, is that your designer may be fresh out of school or could be an intern. Although highly creative with plenty of knowledge, they may not yet be seasoned in listening to their clients, which could negatively affect the outcome of your project. The best designers possess not only the creative skill but they also should possess some experience in the business world. They must be interested in your success and understand the urgency of your needs. Then there are the $199 Custom Websites. Really? This "deal" simply speaks for itself. Truly ask yourself, "does this make sense?" If you then proceed, proceed with an abundance of caution. In all fairness, someone who isn't familiar with the web design process, coding, optimization, etc., could easily fall for this special offer. In a nutshell, hiring a Tampa, Florida website design company who meets your requirements shouldn't be based on cost alone. You've found a site with attractive templates that are priced right. All you need is hosting, then all you do is add your information into the template, right? They make it sound pretty simple. Yet, how easily are these files extracted, configured, edited and published? If you can get that far, why does it not look like the beautiful template you purchased? You've tried to edit it and now none of the pages will link together! How do you get support? Welcome to the help forums, my friend. Tick, Tick, Tick. What Do You Mean, It's Not My Site? Similar to templates that you purchase, there are companies that host your site, then provide you with basic templates within the domain manager or site builder area of your account. Again, building a site this way can be frustrating and restrictive, even for a seasoned developer. There are many behind the scenes tasks that a web developer and website marketing professional will perform when building a custom site, which cannot be done. Additionally, you're paying monthly to use the templates and most of these firms do not allow a full backup of your site... in other words, you never really own the site. Hours of work wasted, only to start all over again unless you stay locked in. You've Found The Perfect Web Designer! Choosing a website designer should not be taken lightly. We recommend that you speak to at least three to four Florida website designers prior to making your decision. If you take some time to ensure that your designer is reliable and that the price is in line with the services you'll receive and you also are comfortable that they will be available to you a month or even a year from now should you need updates or assistance... then you've found the perfect web designer! ASK ABOUT OUR $350 WordPress Website Design Offer. Call us today at (813) 778-9548. Get Your Small Business Website Up and Running! Roll Up Your Sleeves, It's a Jungle Out There! Affordability, Availability, Flexibility, Dependability, Creativity. Website updates, makeovers or re-designs for Tampa and Florida businesses can be obtained affordably and with ease. Call Bay Area Graphics & Marketing or email us with your request for a quote. Let us know what type of website updates you are looking for, such as content writing, image updates, file purging or back-end updates or SEO services. If you require a full website re-design, please let us know. Providing us with as much information as you can allows us to do our best in providing you with a comprehensive quote for website redesign services. Get a Quote or Call us at (813) 778-9548. Simple Website Updates - We'll maintain your site or make simple changes when you need them. Adding content, photos, links, articles or rearranging content on your website should not come at a high price. Updating your website is a necessary task for Tampa, Florida website owners and we make it easy for you to remain consistent in your marketing so you can remain relevant. Website Re-designs - If your website needs re-designing, be careful about how you go about it. Deleting pages, or getting rid of old content on your website can cause more harm than good. Use a Tampa website design firm who understands how to re-design a website properly without negatively affecting your search engine ranking and existing back links. Ask us why this matters. 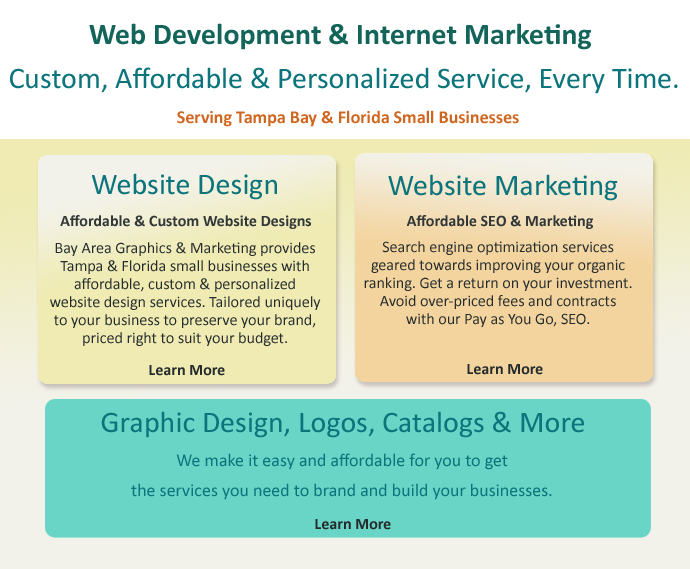 Please contact us for a quote on website re-designs for your Tampa, Florida website. View our website design pricing information if you are interested in a new website design. We offer website updates on an "as needed" basis with no contracts at an affordable hourly rate. This may include search engine optimization services as well as general updates of photos, content, etc. Please, click here for pricing or call us at (813)778-9548.